Left: Celine de Guzman and her mother, Resy Tablante. 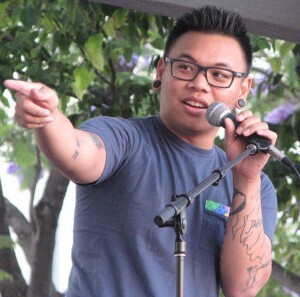 Right: Brandon Ito. 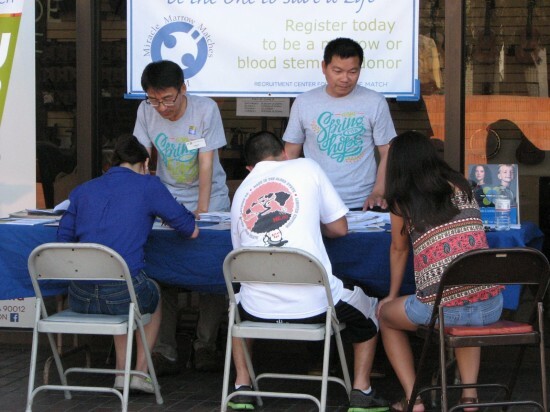 A3M (Asians for Miracle Marrow Matches) held its first “Spring for Hope” benefit on June 1 at the JACCC Plaza in Little Tokyo to publicize the continuing need for bone marrow donors for patients with life-threatening blood diseases. The best chance for a match is among people of the same ethnicity or race as the patient. Serving as emcees were actors Aaron Takahashi and Jully Lee, both members of the improv group Cold Tofu. Executive Director Shin Ito spoke on behalf of A3M. Patients who received life-saving transplants told their stories. At age 13, Brandon Ito was saved by an unlikely donor — his mother. In the majority of cases, the patient’s family members are not a match. He has started his own nonprofit, The Brandon Ito Project, to grant small wishes to pediatric cancer patients during their time of treatment. Celine de Guzman, now a teenager, received her transplant as an infant. She has no memory of the operation, but was recently able to meet her donor, a woman from Hawaii. Her mother, Resy Tablante, urged everyone to join the registry and give patients like her daughter a chance to live. Traneka Davis, an African American with non-Hodgkin’s lymphoma, also stressed the importance of having more people of color sign up as potential donors. Live music was provided by YouTube sensation AJ Rafael, Miko Shudo, Miya Folick, Connie Lim, and Leisure Brown (Jason Arimoto on ukulele and Brad Ranola on percussion). Food was provided by The Mighty Boba Truck, Umaizo, and Maui Natural Ice. Visitors between the ages of 18 and 44 had the opportunity to sign up for the registry of potential donors — all that is needed is a cheek swab. There was also a booth where kids could make cards for patients who are waiting for a match. For more information, call 1-888-A3M-HOPE (238-4673), email [email protected] or visit www.a3mhope.org. Left: Miya Folick. Right: Connie Lim. Left: Leisure Brown. Right: Miko Shudo. Left: Jully Lee and Aaron Takahashi. Right: Shin Ito. Attendees sign up as potential marrow donors.